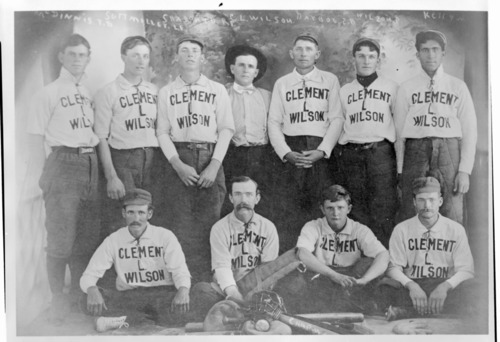 This black and white photograph is a studio portrait of the Clement L. Wilson baseball team from Tribune. Handwritten inscriptions identify the individuals who are standing, but they are somewhat difficult to read. From left to right, the names in the top row appear to be: McGinnis, Suttmiller, Shappard, C.L. Wilson, Dayboe, Wilson, Kelly. According to the federal census, Clement Wilson was a Tribune lawyer. This black and white photograph is a studio portrait of the Clement L. Wilson baseball team from Tribune. Handwritten inscriptions identify the individuals who are standing, but they are somewhat difficult to read. From left to right, the names in the top row appear to be: McGinnis, Suttmiller, Shappard, C.L. Wilson, Dayboe, Wilson, Kelly. According to the federal census, Clement Wilson was a Tribune lawyer.